Ted Castaneda’s career as a distance runner started during his prep years at Colorado Springs’ Palmer High School. From there he went on to the University of Colorado in Boulder, where he earned All-America honors four times in track and once in cross-country. His best times include a 3:58.5 mile, an 8:29 two-mile, a 28:30 in the 10k, and a 2-hour, 15-minute marathon. 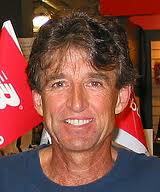 He also competed in two U.S. Olympic Trials (5,000m and 10,000m in 1976, marathon in 1980). Castaneda has served as head coach of the men’s cross country team at Colorado College since 1980, when he also started as a volunteer assistant with the track and field program. He took over as head coach for women’s cross-country in 1993 and for track and field in 1994. During his coaching tenure, 22 cross-country and track athletes have earned All-America honors. 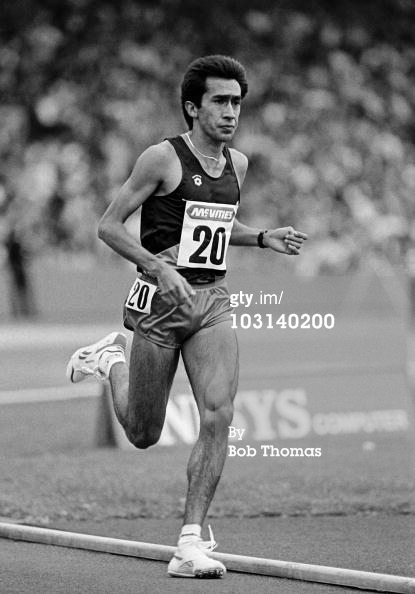 Arturo Barrios rose to fame in the early ’80s setting his first world record in 1986 in the 10,000m road race. 1987 saw Barrios set the world record for the four-mile road race. Between 1987 and 1990, Arturo won the San Francisco Bay to Breakers race, considered the largest footrace in the world, four consecutive times. Arturo competed in the 1988 Olympic games, placing fifth in the 10,000m. In 1989 he broke the world record for the 10,000m track race by over five seconds with a time of 27:08:32. Arturo continued his remarkable running in 1991 when he set a new world record in the 20,000m on a track at 56:55:06. During that race, Barrios also became the first man to run a half marathon in less than an hour. The following year, Barrios returned to the Olympics in Barcelona to compete in the 10,000m and placed fifth. The Mexican National record holder in the 5,000m and 10,000m, Barrios is still active in the running community. Steve Jones is a Welsh athlete and former world marathon record holder. He has won both the New York City and London Marathons, as well as the Chicago Marathon twice. He finished 8th in the 1984 Olympic 10,000m. In his first full marathon, he won the Chicago Marathon, coming in at 2:08:05 and thus breaking the world marathon record. In 1985 he achieved his career best marathon time of 2:07:13 in winning the Chicago Marathon, just missing the world record again by one second. This time remains the fastest of any British runner. In the 1988 New York City Marathon, Steve won by over three minutes with a time of 2:08:20. He was the first Welsh athlete to appear on the cover of the prestigious running magazine Running Times. Steve currently coaches runners through the training group Boulder Express. 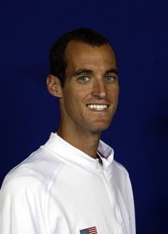 Alan Culpepper is a track and field and cross-country athlete, qualifying twice in the Olympics: in 2000 in the 10,000m and in 2004 in the marathon. Culpepper finished 17th in the 10,000-meter run in Sydney and 12th in the marathon in Athens. He was also a seven-time All-American, earning three of the honors in cross-country and four in track. When he began running the marathon in 2002, his time of 2:09.41 in Chicago tied him for the fastest American debut in U.S. history. In 2005, his fourth place finish in the Boston Marathon was the highest finish for an American in 20 years. The next year, he finished fifth in the Boston Marathon and won the Denver Half-Marathon. Now retired, Alan and his wife Shayne Culpepper (neè Willie), fellow Olympian and CU alum, spend their time enjoying life with their four children and leading an after-school running program at Boulder’s Douglass Elementary School. Adam Goucher is an American Olympic track and field athlete. While attending the University of Colorado, Adam won two NCAA indoor track titles in the 3,000m and an outdoor NCAA track title in the 5,000m. After three top ten finishes, he finally won the NCAA Division I cross-country title. In 2000, he made his first Olympic team, placing first in the Olympic trials in the 5000m. He was 13th in the 5000m at the 2000 Sydney Olympic Games, despite serious battles with back troubles. In 2008, he attended the US Olympic Trials in hopes of qualifying in the 5k and 10k. His time of 13:56.25 in the semifinal of the 5k was enough to advance to the finals, but after holding the lead for several laps, he dropped out of the race with two laps remaining. He finished seventh in the 10k final, failing to qualify for the Olympics, but besting his previous 10k personal record. He currently resides in Portland, Oregon, with his wife, Kara Goucher, also a professional runner, and their son, Colton Mirko. Elva Dryer (neè Martinez) is a three-time qualifying track and field Olympian: placing 3rd in the 5,000m at the 2000 Olympic trials; second in the 10,000m at the 2004 Olympic trials, finishing 19th in the event; and 15th in the 10,000m at the 2008 Olympic trials. During her college career at Western State, Elva won two NCAA D-II cross country titles, and was national champ in the 3,000m four times, the only person to achieve that feat. Dryer was the top American finisher at the 2007 ING New York City Marathon, placing 6th (2:35:15). She married Russ Dryer, a former All-American cross-country runner and fellow Western State alum, and he has coached her ever since. Elva’s hobbies include crocheting and reading.